As many of you know, I am on a roll when it comes to re-purposing Rebecca’s outgrown clothes. So I wanted to share a clever trick with you. My 4 month old is a big drooler. She loves to smile and as a result, drools all over her shirt. So rather than keep washing her good bibs over and over, which I need for milk spurts, I discovered yet another good use for an outgrown pyjama top or t-shirt! Now mind you, this started out as a beautiful 0-3 months full pyjama with feetsies. Rebecca wore it like crazy until it started to pill. 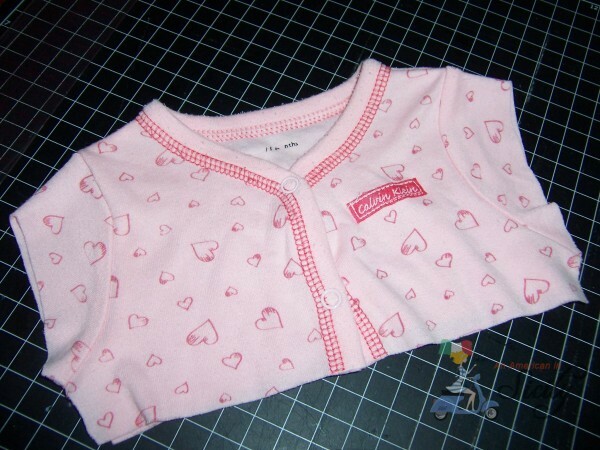 Then, when she got a bit taller, I cut off the feetsies, so they were still pajamas that she wore for a while. Later, summer hit, so then the long sleeves and long pants were too much for out warm Sicilian summers. I then cut off the top half and made some summer capri house pants for her using elastic at the waist…which, till this day, at 4 1\2 months, she still wears very comfortably.